Message: Marc’s act is edgy, incorporates a colorful cast of characters, and is downright funny. But above all, it’s interactive, and involves audience volunteers to add a bold, unrehearsed element that sets him apart. 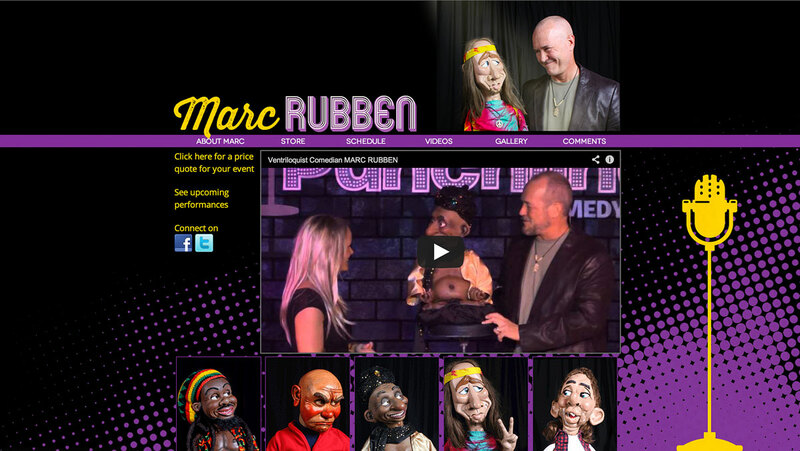 This project was about redesigning Marc’s old web site with a fresh look and more interactive features. Solution: We decided to put Marc’s act front and center, with a Youtube embed that introduces his highlight reel right on the home page. Add to that the animated GIFs of his main stars livening up the bottom part of the screen, and the viewer knows without a doubt what Marc is all about. The microphone and the halftone pattern in the background balance out the constantly moving foreground, framing off the main content and directing the viewer’s attention to what’s important. Click here to visit the live web site.